James Dewey Watson (born April 6, 1928) is an American molecular biologist, geneticist and zoologist, best known as one of the co-discoverers of the structure of DNA in 1953 with Francis Crick. Watson, Crick, and Maurice Wilkins were awarded the 1962 Nobel Prize in Physiology or Medicine "for their discoveries concerning the molecular structure of nucleic acids and its significance for information transfer in living material". Watson earned degrees at the University of Chicago (B.S., 1947) and Indiana University (Ph.D., 1950). Following a post-doctoral year at the University of Copenhagen with Herman Kalckar and Ole Maaloe, later Watson worked at the University of Cambridge's Cavendish Laboratory in England, where he first met his future collaborator and friend Francis Crick. From 1956 to 1976, Watson was on the faculty of the Harvard University Biology Department, promoting research in molecular biology. From 1968 he served as director of Cold Spring Harbor Laboratory (CSHL), greatly expanding its level of funding and research. At CSHL, he shifted his research emphasis to the study of cancer, along with making it a world leading research center in molecular biology. In 1994, he started as president and served for 10 years. He was then appointed chancellor, serving until he resigned in 2007 after making controversial comments claiming a link between intelligence and race. 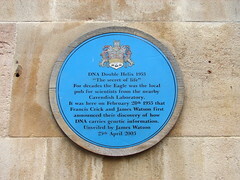 Between 1988 and 1992, Watson was associated with the National Institutes of Health, helping to establish the Human Genome Project. Watson has written many science books, including the textbook Molecular Biology of the Gene (1965) and his bestselling book The Double Helix (1968). The latter is about the DNA structure discovery, reissued in a new edition in 2012 – The Annotated and Illustrated Double Helix edited by Alex Gann and Jan Witkowski.